>Heritage Breeds. Are They Worth It? 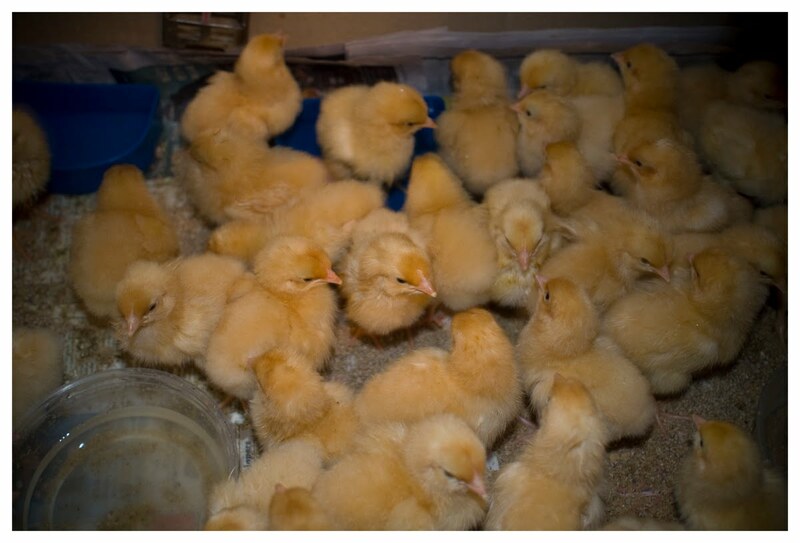 Posted byevelynscrackers	 March 2, 2011 July 6, 2011 1 Comment on >Heritage Breeds. Are They Worth It? Last Spring we bought some Buff Orpingtons, a heritage breed of chicken, to be raised by our farmer friend. By choosing from a list of endangered foods our search for tasty local chicken would soon be over. We ran into a few challenges along the way that made us question if our little adventure was worth it. I received a phone call from our soon-to-be surrogate family farmer. The chicks were do to arrive at the airport (This particular breed, found on the Slow Food Arc of Taste had to be flown in from Alberta.) and I was asked if I could pick them up? It just so happened I was picking up my mother-in-law at the airport at the same time the birds were expected to arrive. So, Evelyn and I jumped into the car and off we went. Arriving on time, we hurried to get Grammy. “Great to see you!” “Where are your bags?” “We have to pick up some chicks!” She took the news in stride knowing quite well of our efforts with local food and farmers. In fact, she grew up on a farm in South Carolina and tells great stories of grudgingly gathering eggs and her failed attempt to wring a neck. With more experiences on a farm than one can imagine, we were in very good company if things got out of hand. Living in an apartment, our bath tub was where we did the unveiling. Two dozen golden puff balls with tiny legs and black eyes were climbing onto each another, scratching and pecking. Luckily, I found a heat lamp at a local hardware store along with some chick-feed. We put in some fresh newspaper into the box and gave them tiny cups of water. The cheeping was non-stop, beautiful and life affirming. They became louder each time we checked on them, which was often. What a wonderful responsibility to have one afternoon. A few months later we visited the chicks on the farm. The birds were much larger now and had beautiful copper-colored plumage. Once inside the pen we tried to get closer. Right away, they ran to the other side from where we stood as quick as a breeze through tall grass. Now, Evelyn is a bit of pigeon chaser. I was trying to photograph the chicken experience and she was in full pigeon mode chasing them from one side of the pen to the other. Watching her running in circles, laughing hysterically and getting out of breath was priceless. I know where the expression “scared as a chicken” comes from as they did everything short of jumping over the fence to get away. Come September, the inaugural chicken was cooked slowly in a cast-iron pan on a bed of potatoes, carrots and onions. After an hour and half, or so, it was removed from the pan and allowed to cool. The kale, which we relish this time of year, was added with garlic and cooked in the juices. The chicken had a lean earthy flavor, quite pleasant, but a little tough. I didn’t mind the chewiness at first. If we had a guest to dinner would they be as tolerant? Probably not, since it was getting to the point of almost making your jaw tired. Not a lot of breast meat and not a lot on the legs either, but we ate well nonetheless. This chicken dinner had been planned for months and I felt a kinship to the chicken and to the farmer who raised them. Just as many people during the turn of the last century grew their own food and were self-reliant. They ate for survival and not so much for comfort. I don’t think we are that far away that we can’t think about our food in the same vein, now and again. We are poaching the whole birds, now and are making wonderful stews and soups. We eat more meals with one chicken by slow cooking them in a broth that makes the meat quite tender and the clean earthy flavors are hard to come by with most store bought birds. Overall, it has been a very rewarding experience and something for us to look forward to, not only during the summer, but all year round. So great to be closer to the source of our food and participate in the process. Mmmm, what shall we try next?